Government troops and United Nations peacekeepers in eastern Democratic Republic of Congo have launched an offensive against Rwandan Hutu rebels. The operation in North Kivu province follows reports of increased looting in the area, and involves 750 Congolese soldiers and 100 from the UN force. 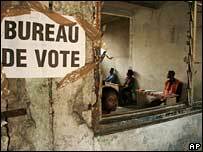 Elections in DR Congo, the first in 40 years, are scheduled for June. Congolese and UN forces are trying to bring peace to the east, which remains unstable after war from 1998 to 2002. Major Hans Reichen, a spokesman for the UN Mission in Congo, told the BBC that small groups of Rwandan rebels were operating in North Kivu and moving around in small groups, although exact numbers were not clear. Maj Ajay Dalal of the UN force told AP news agency the force wanted to push members of the Democratic Liberation Forces from their hilltop camps in North Kivu province in a five-day operation. "We will launch more operations as the elections approach to ensure safe elections," he said. Rwandan Hutu rebels fled into the then Zaire, now DR Congo, to escape reprisals following the genocide against Rwanda's Tutsi minority and moderate Hutus in 1994. Rwanda has twice invaded DR Congo in attempts to dislodge the rebels. The world's largest United Nations peacekeeping force - nearly 17,000 troops - is tasked with ensuring the elections go smoothly. A German-led European Union force will be deployed shortly before the polls and will stay for up to four months. Some 450 soldiers will be based in Kinshasa with another 1,000 on standby outside DR Congo. In the east of the country, hostilities between rival militias and government forces continue to force hundreds of thousands of displaced people from their homes.